From previous reports, you will know that I have been home alone for a short while, whilst my wife and children are in South Africa with the in-laws. During this time, my own mother asked if I would take her to a German Chirstmas market, as we had done a few years previously to Hamburg. Naturally I agreed, and set about finding a good deal on transport and accommodation. All big cities in Germany have the markets, and it seems most small towns do as well, so the choice was mainly down to travel. Deutsche Bahn have a deal called "London Spezial" where a one-way ticket from anywhere in Germany to London costs EUR49, provided it is booked early enough. I thought this would be a good idea to get to somewhere, and then found a price on Germanwings for the return to Stansted for GBP24 each from Cologne. This was the clincher, so I booked the 4U flights (at good times of the day, not at stupid o'clock like some cheap flights!) and when the DB tickets went on sale 90 days before, I bought them instantly. This ticket includes Eurostar from London to Brussels, then ICE train onwards. 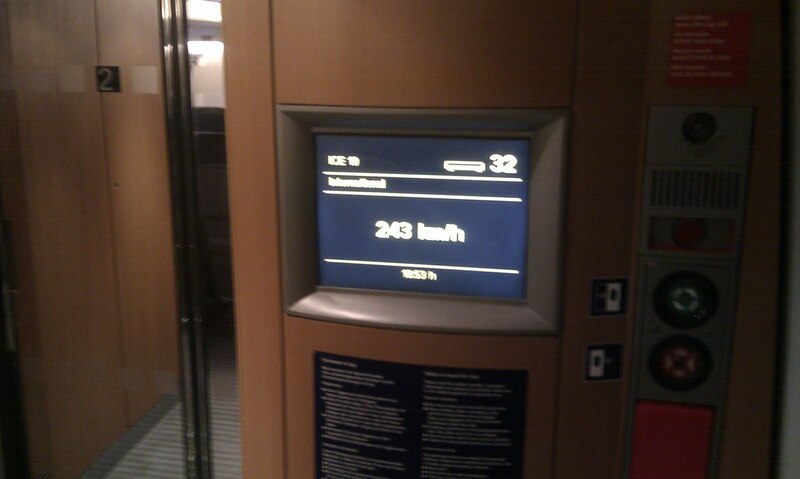 There are also Thalys trains to Cologne, but these were not part of the offer. I also then found a cheapish hotel in the suburbs, B & B Hotel in Frechen, near a tram stop. The outward ticket was finished with a one-way 1st class ticket from Norwich to London for £12 for me and £8 for my mum (with her senior railcard) - train from Stansted to Newmarket where I had left my car at the office I left as the price was the same on the day, so I left it in case of any problems (ie plane delay missing the last train so needing to take the bus instead). Fast forward to the day in question, 6th December. I met my mum at Norwich station after stopping at Subway for a hot breakfast sandwich on the way, and we found our 1st class seats. They were identical to the ones in my last report. The journey was ok, despite the train waiting for 15 minutes in Diss station due to a potential problem with the brakes, but on testing they were found to be fine. I wasn't worried as I had built a substantial window for delay into our connection. We arrived at Liverpool St Station and took the tube to St Pancras, where the Eurostar departs from. St Pancras station, note the large Christmas tree made from Lego. We arrived in plenty of time, and looked around the station. Sandwiches were bought from M&S, and we proceeded through the checkin line - I had a DB e-ticket printout so was directed to the manned desk rather than the machine gates. Through security and passport control, we sat to eat our sandwiches, then when the crowds cleared slightly as a Paris train was boarding, we bought a cake and some hot drinks from the Costa. Eventually it was our turn to board, and we went up the escalator to the platform and found our seats on the train. The journey passed smoothly, watching the cars on the adjacent M2 and M20 motorways being left behind is always good. Soon enough the train dipped into the tunnel, and out into France. 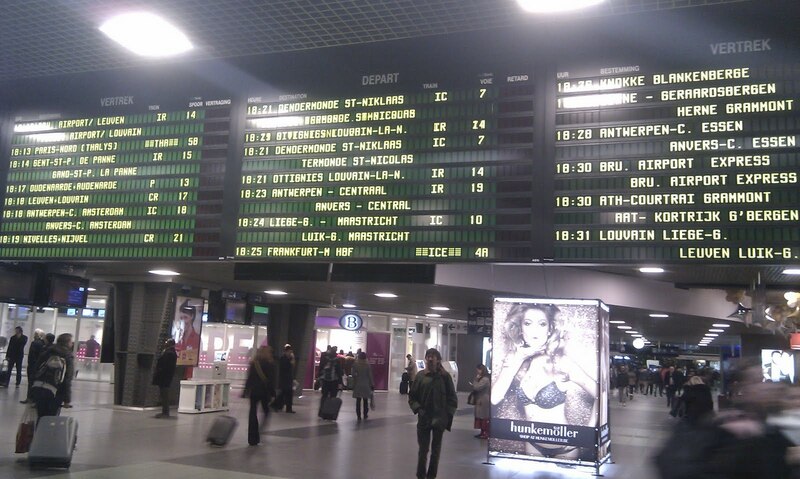 A while later, we stopped in Lille where quite a lot of passengers got off - Eurostar offers connections from here to Marseille and the south of France, bypassing Paris. Then it was on to Brussels, by this time however it had gotten dark. 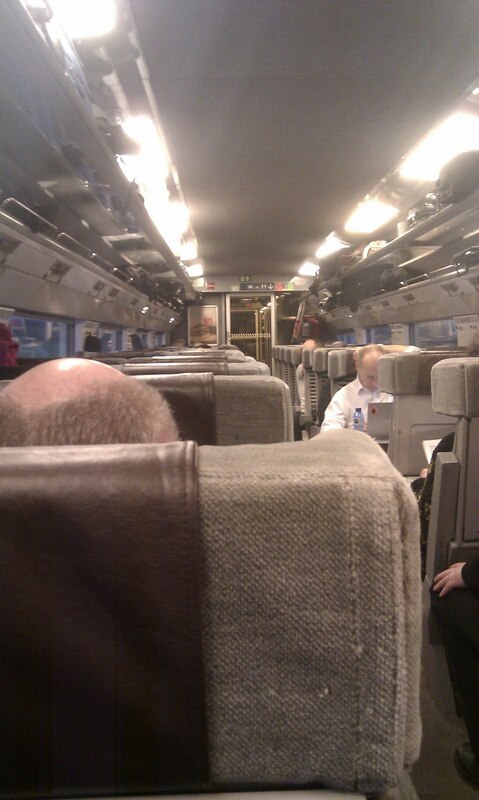 Less than 2 hours to Brussels, with an on-time arrival. We got off the train here, and went to find our connection. We had about 35 minutes to connect, which was plenty of time. 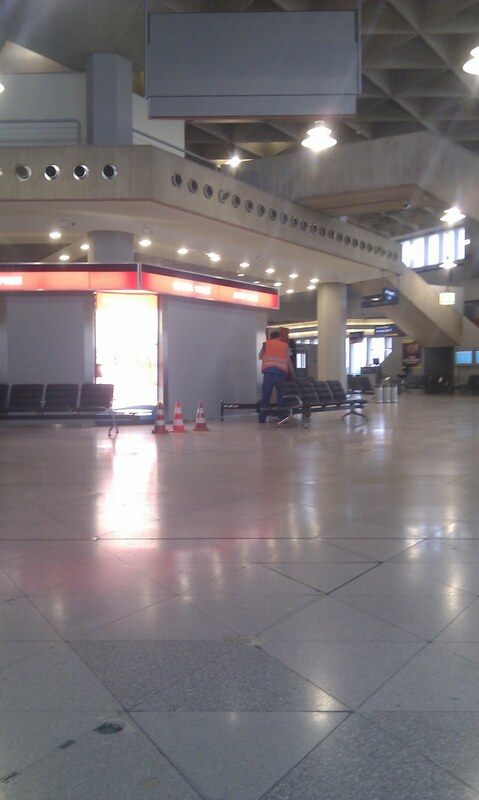 My mum bought a bottle of water from a machine, and we found our train already on the platform, but we couldn't board yet. Apparently boarding is only allowed 15 mins before departure, and bang on then the doors opened. Our seats were in the last carriage, and through the rear glass you could see out to the tracks behind. Would have been very cool to sit in the seats next to the view but ours were accross the vestibule in the next section. Our train, waiting to board. View from my seat. 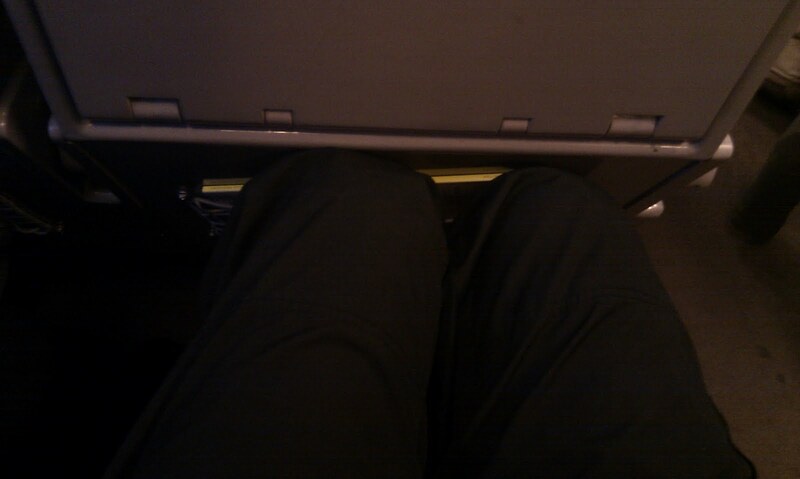 Plenty of legroom. 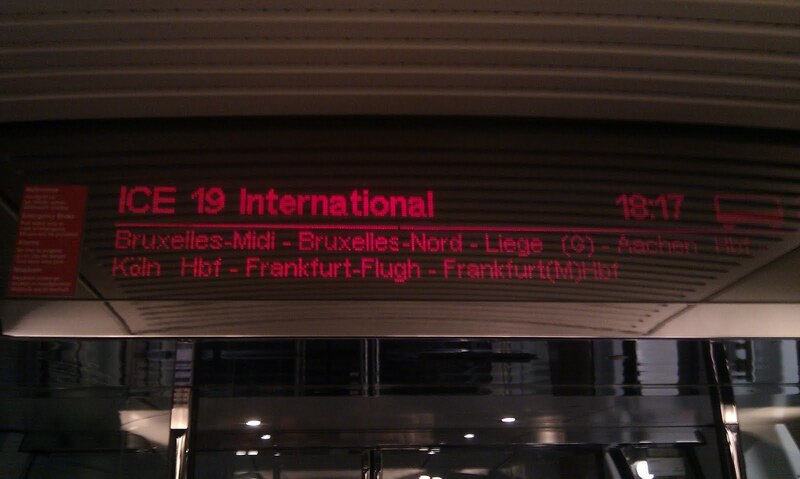 The train pulled out slowly, stopping at Brussels Nord, before hitting the high speed track to Liège. After stopping at Liège and Aachen, we arrived at Cologne on time. By now it was getting late, so we had dinner in a fast food Asian noodle bar on the station, and had a look outside at the cathedral and market. We struggled to find a stall selling Glüwein, as most seemed to be closing around 21.00, but one was still open and we had our hot mulled wine and kept the mugs as souvenirs (you pay a EUR2.50 deposit on the mugs, or you can keep them, as we did). We then caught the tram out to our hotel at Frechen, which as the reception had closed at 22:00 we had to use the electronic kiosk to pay and receive a code for the main door and our room. The next morning we had the full day in Cologne. We had breakfast at an Oebel bakery near the hotel before heading back into the city on the tram. Our first stop was Neumarkt, where we looked around the market there, before walking along to the river and the chocolate museum, which is now branded by Lindt. For anyone remotely interested in chocolate, the museum is well worth a visit. Detailing the history of chocolate manufacture and consumption through the ages, and old and new advertising for brands throughout the world (not just Lindt) - though Cadbury's was conspicuous by its absence! On leaving the museum, we stopped at the small market outside for some lunch - bratwurst and currywurst. We continued to yet another market, by Heumarkt, which had an ice rink and ferris wheel. Here we continued eating with some fried potato rosti with apple sauce before heading to a cafe for some cake. We then visited the cathedral itself. One of the stained glass windows was this random pixel design, the others were all traditional bibical scenes. By now it was getting dark, so we headed back to the Newmarkt market and my mum bought some small decorations, and we found a Turkish restaurant for dinner. We then headed back to the hotel. As there was free wifi, I checked the Germanwings site, and using my phone checked us in online, using mobile boarding passes. Basically this means that I was emailed a barcode each to scan at the airport. The next day we were due to fly home. Our flight was at 15:50 so we still had the morning in the city. We packed up our belongings and hit the tram for the last time, and had a last look around the cathedral market. We also decided to visit the Roman museum, well worth it if you are even remotely interested in classical times. 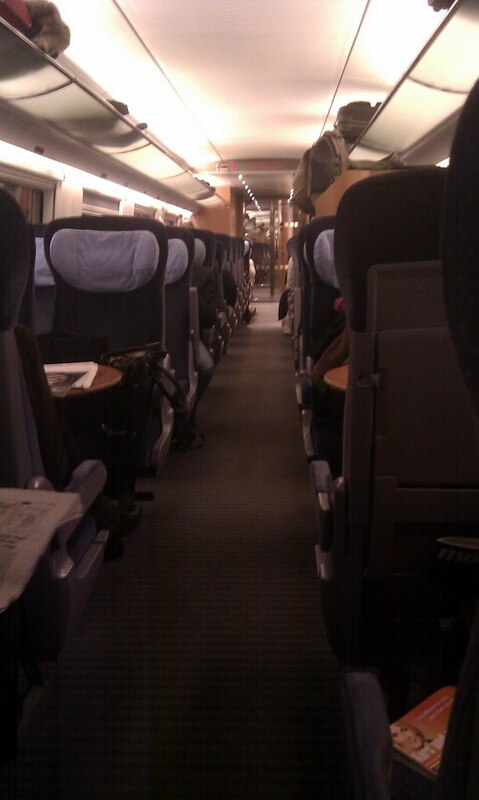 We then took the S-Bahn to the airport. Walking from station into termainl. 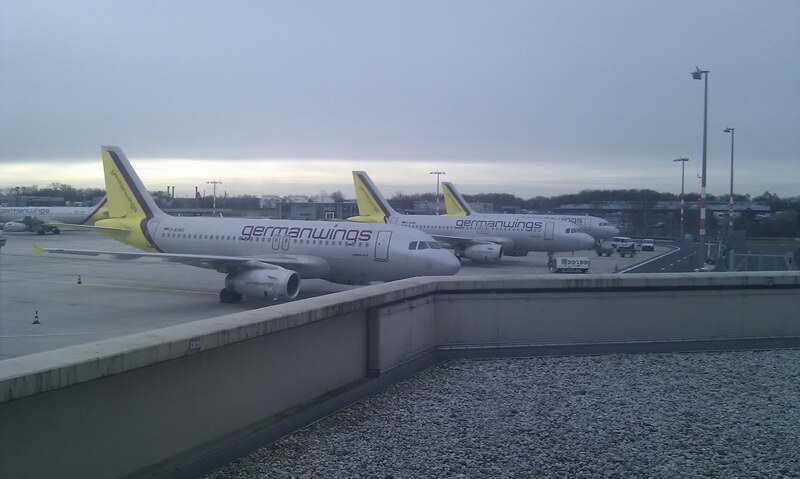 Whilst walking from the station into the terminal, we saw a line of 4U A319s lined up - it turned out that the front one was ours. I tried to use a machine to print off a paper boarding pass, but it just said "You are already checked in" so wouldn't - I figured if there was a problem at security or the gate I'd come back and ask, but there was no need in the end. We headed round the terminal to find the viewing deck. After a cold few minutes, during which I watched a FedEx MD11 land, we headed back inside to find some lunch. We settled on sandwiches from a bakery-type place that had a seating area with a view of the apron - though there was not much action! The LH 737 didn't move the entire time. We did see a "Luftwaffe" A330-based transport plane arrive, and my mum was surprised to see the word "Luftwaffe" actually still in use. View from our cafe seats. 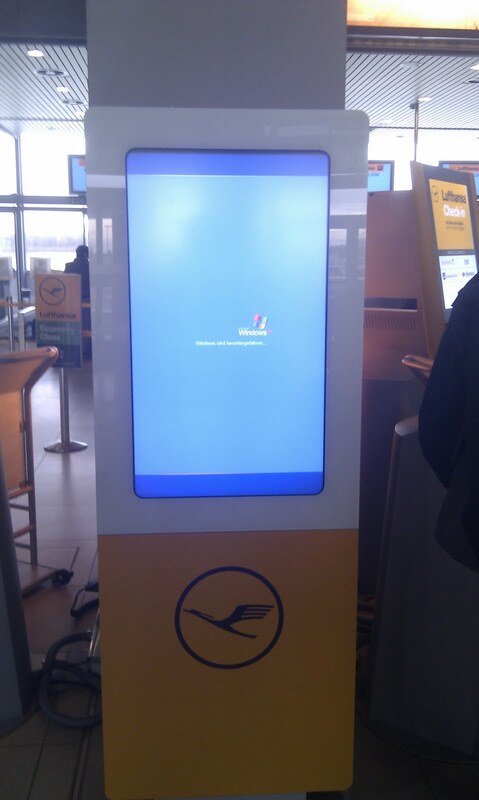 We passed the LH checkin desks and I noticed one of the self-checkin kiosks had a windows error. By this time we arrived at security to find a massive queue, and only 4 of the 8 x-rays open. Eventually we got through, the mobile boarding pass was fine. Our gate was along to the right, so we headed straight there. There was a boarding pass check, and passport control - but the 3 staffed desks must have had some kind of computer problem as they weren't allowing anyone to pass, and speaking urgently on the phone to someone. Eventually one of the desks opened, to process the queue that had by this time formed. Inside was a duty free shop, a cafe and some seats. By the gate was parked another 4U A319 - I took a picture but it turned out not to be ours. When boarding started, we went downstairs to a bus - which then drove round the corner to the aircraft. 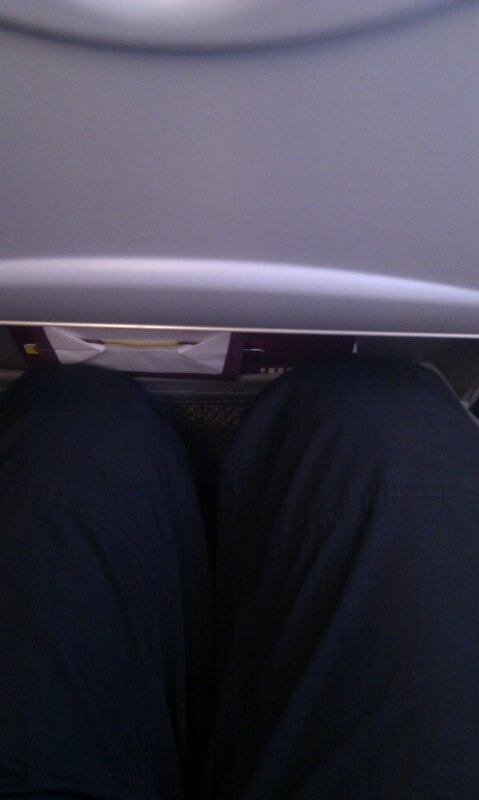 Legroom shot. Not too bad. 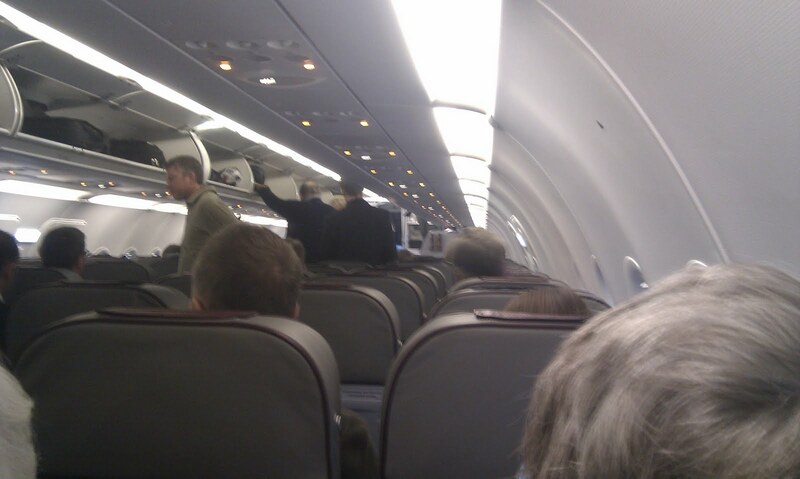 Everyone boarded, it was quite full with a few empty seats here and there. It was a quick taxi to the end of the runway, and a powerful liftoff and climbout. It was a short flight after all. Looking out of the window I could see the meandering Rhine before passing through the cloud layer, which would remain in place until landing. We disembarked through an airbridge and caught the shuttle train to the terminal. There were massive queues for passport control, but as my mum's doesn't have the chip in it we had to stay and wait for an agent. The wait was about 25 mins, impressive considering how many people were waiting. The guy in front had come in on the Luxemboug flight, apparently they had almost touched down at LCY but pulled up at the last minute, either through high winds or fog. They then had to take a bus to LCY instead. Us however, once we cleared immigration, headed for the station to buy a ticket to Newmarket via Cambridge. There were major problems on the Cambridge to Kings Cross line (someone under a train, and also a broken down train elsewhere on the line) so the station was horrendously busy, but our trains were fine, and we were soon back in the car heading for home. Overall then a good trip. The train to Germany is certainly an option to consider, especially when DB gets to run trains direct to London - this will eliminate the 45 minute wait in Brussels. 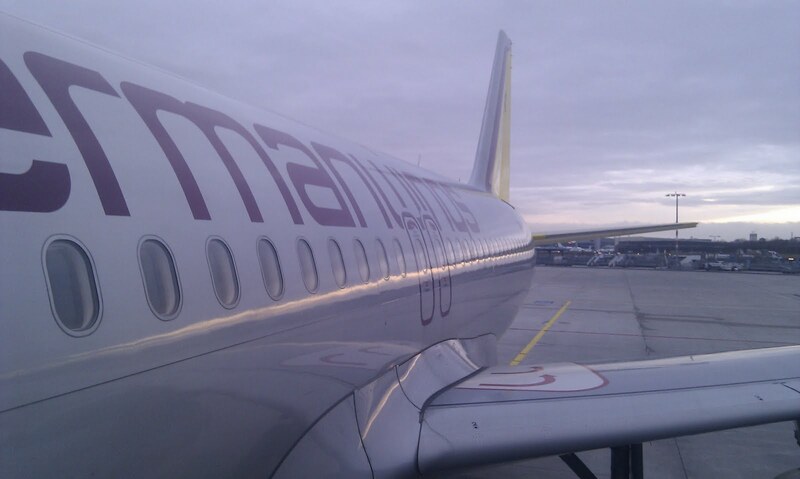 Germanwings are certainly a good LCC, I would consider using them again (indeed, I had another flight booked with them but it was cancelled - all will be revealed in the next report). And Cologne Christmas markets are certainly something special, worth a visit!